Mrs. Manu Naskar (25 year old), wife of Kartik Naskar, is a resident of Nimpith village under Block – II of Joynagar police station in 24 Paraganas (South) district. On 9thAugust at around8:30 pm, she was returning from Nimpith market where the couple owns a retail garments store. Once Manu reached Ramkrishna Ashram Krishi Vigyan Kendra, Nimpith, she noticed that 3 youths, who were later identified as Muslims, were following her on a motorbike. Soon, they grabbed one end of her sari and also molested her. Sensing trouble, she called the local youth activist of Hindu Samhati, Kripa Sindhu Halder, for help while the miscreants parked their motorcycle a few yards away and advanced towards a petrified Manu. Halder gathered few of his friends and rushed to the spot and found helpless Manu Naskar encircled by the miscreants. A fully packed Mahajati Sadan auditorium signaled the success of Hindu Samhati's attempt to commemorate the glorious acts of Gopal Chandra Mukherjee after the infamous Direct Action day. On 16th of August, 1946, he valiantly took up arms in defense of fellow Hindus in Kolkata gainst the pro-Islamic government Bengal that schemed to uproot Hindus from Kolkata and its neighborhood. 68 years later on the same date, members of Hindu Samhati as well as ordinary citizens of Kolkata and suburbs gathered at Mahajati Sadan with a single mission to honor the great hero of Bengal and pay homage to his services on that fatef Swami Pradiptanandaji Maharaj from Bharat Sevashram Sangha, Prof. Saradindu Mukherjee from Delhi University, Ashok Mal and several others including relatives of Gopal Chandra Mukherjee. The convention was presided by Tapan Ghosh, president of the Hindu Samhati. 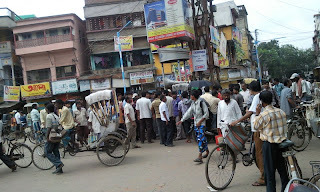 Following the unexpected release of Mohammad Lalbabu Munshi (culprit of molesting Shilpi – student of Class IV at Chengail Kiran Sashi Siksha Mandir) and unwillingness of both school authority and police to ensure safety of girl students in the locality, simmering anger of people burst out on July 31 morning when local youths brought out a protest march against brazen developments. Local youths went to both Chengail Kiran Sashi Siksha Mandir and Chengail SriVidyaniketanHigh School(opened after Panchayat election and counting) to close down the two educational institutions as a mark of protest. Even if an examination was going on in the high school, school authority folded the institution to support the protest march.